Passion is something that younger and older generations can both detect immediately. After all, it’s either there or it isn’t. When elementary school students encouraged Kei Hirata to return to cheerleading overseas, their support inspired her. She decided to pursue her passion once again. 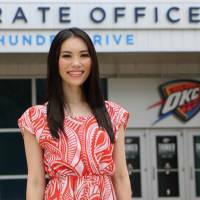 Now, almost a year later, Hirata is embarking on her second two-year stint as a member of the Thunder Girls, the Oklahoma City Thunder’s dance team. Learning about her journey back to the NBA after a four-year absence was one interesting aspect of an interview this week. 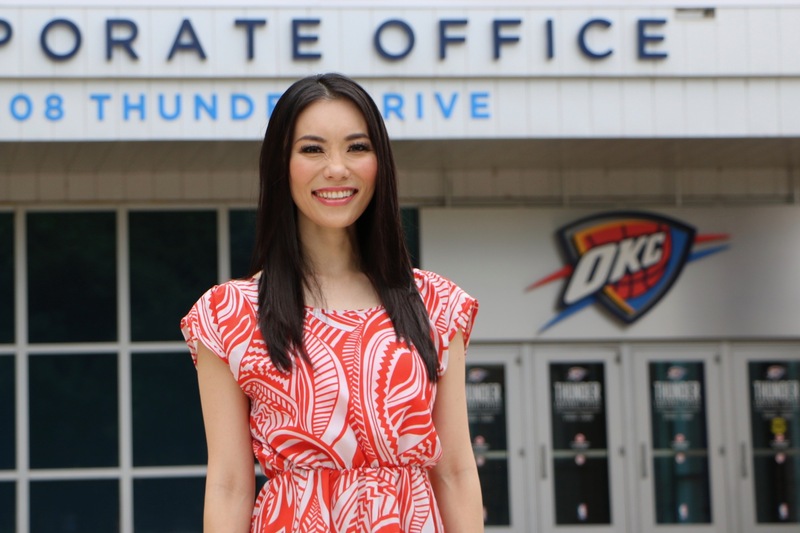 Speaking by phone from Oklahoma, Hirata reflected on her decision to attend Thunder Girls tryouts last month and pursue the possibility of a return to the NBA. For Hirata, it’s a dream come true. “I’m so happy to be back here,” Hirata said in a cheerful tone. The Thunder Girls revealed their 20-member squad for the 2018-19 season on July 26. About 100 women participated in the preliminary auditions before the number was trimmed to 30 finalists. Hirata recounted that experience when I called her Thursday morning (Wednesday night in Oklahoma). The team held the final auditions at Riverwind Casino in Norman, Oklahoma, before a live audience, which made the test an even tougher one. Was she able to relax during those tense moments? “It makes (you) so nervous,” admitted Hirata, who turns 34 on Aug. 24. “Every girl is holding hands . . . and waiting. And my number was called almost as the last number, and I was so nervous. I did everything I could do. I really wanted to make it . . . and once I (heard) my number I was so happy, and at the same time I couldn’t believe it. A native of Chiba, Hirata began learning classic ballet at age 3 and took lessons until she was 17. She also participated in track and field, tennis and lacrosse before her college years. Her passion for cheerleading began in 2006, when she joined M-Splash! !, the Chiba Lotte Marines cheerleading squad. And she discovered a passion for cheerleading during that time. “It’s a job, but I feel like it’s not a job; it’s so much fun, and I’m so passionate about getting involved in the community or giving back to the community. That’s my happiness and passion,” said Hirata, who received a Bachelor of Arts in English language from Kanda University of International Studies in Chiba and also studied abroad at the University of Essex in Colchester, England. Without that passion, Hirata probably wouldn’t have built up an impressive resume with experience after experience related to cheerleading. A quick rundown on some of her key experiences as a cheerleader: X League’s IBM BigBlue (2009-10), J. League’s JEF United Chiba (2011-12), Tokyo Girls (2011-12 for the pro dance team that made appearances at an NFL Super Bowl party, the FIVB Volleyball World Cup and a Japan national team baseball game, among other events), then a stint No. 1 with the Thunder Girls (2012-14). To get there, Hirata, an assistant to the direct general of the Japan Sports Arbitration Agency from June 2015 to June 2018 in Tokyo, needed to be nudged in that direction. During her travels around Japan over the past 10 months as a representative of the Japan Football Association-founded Kokoro Project, an initiative that began in 2007 and involves pro athletes from various sports visiting schools in Japan and abroad, Hirata met children in Aomori, Niigata, Chiba and Shizuoka prefectures (more than 200 kids, she estimated). She spoke to them about her dream of becoming an NBA cheerleader, what it took to achieve that dream, and explained the challenges she faced along the way. In one of those classes last September, some of the kids asked her the same question: Did she want to go back to OKC to try out for the Thunder Girls again? “That’s my trigger to think about tryouts again for the Thunder Girls,” she said candidly. The first step, however, was taken in Japan. Hirata tried out for the Akatsuki Venus cheerleading squad, which performs at Japan men’s national basketball team games, in early October. She made the team and was appointed captain. Hirata acknowledged that cheerleading for a pro sports team is a “part-time job but a full-time commitment.” Most of the NBA dancers she knows work additional part-time or full-time jobs or are students. While with the Thunder Girls for the next two years, she plans to stay busy juggling additional work as well, doing it remotely. She serves as an Albirex cheerleader director (for the Niigata-based J. League and B. League franchises) and choreographs halftime routines for the J. League’s Gamba Osaka Cheer Dance Team, continuing to work for both organizations while on the other side of the Pacific Ocean. Blessed with talent, experience and passion for cheerleading, Hirata was in the right place at the right time last month. And even though she showcased her skills during the various portions of the audition, including hip-hop and high-kick movements plus jumps as part of a freestyle routine, she wasn’t sure if she did enough to make the team. Kei Hirata’s prayer was answered.